Updated to work with all versions of the iPhone and iPOD Touch version 3.0 or earlier. A world of word fun from Aardvark to Zebra! AArdvark Word Search is a traditional word find puzzle game with three unique levels of difficulty. Find and mark all of the hidden words to score. 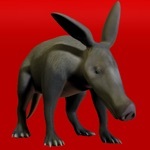 Find Aardvark in each puzzle for a special bonus. Finish quickly to receive a score bonus. Upload your high scores to the server for bragging rights!